This post is the last of a series on everything you need to know about turkey. Trying to figure out what kind of turkey to buy? Here’s what you need to know. Here are the two secret turkey tricks no one ever told you about. And, don’t forget to truss your turkey for even cooking using our handy-dandy guide. Over the past week, we’ve shared 5 steps to help you get to a picture-perfect turkey. With Thanksgiving only 2 days away, it’s time to bring it all together into this post, our 2012 Complete Guide to Cooking a Turkey with everything from choosing to dry-brining to trussing, roasting, and carving in one place with step-by-step photos to guide you every step of the way. It’s your year to be a Turkey Ninja, and we’re here to help. So, if you want to have dinner at 6pm, aim to have the turkey out of the oven at 5pm and work backwards from there. First, we need to make sure that we’re starting with the right “raw materials” because our final product is only going to be as good as what we put into it. We wrote an entire post on how to choose your Thanksgiving turkey and our choice was a fresh, natural, organic, free-range turkey. If you can afford to splurge on a heritage turkey, by all means do so, but what we recommend is a delicious bird that won’t break the bank. Regardless, our goal in this endeavor is to let the natural flavor of the turkey shine through so buy the best you can afford. Most store-bought turkeys come with a couple of things that we need to take care of. First, reach into the cavity and take out the neck (it looks like a long curved piece of bone with some meat attached. Set it aside. Then, you may notice a plastic or metal thing holding the legs together, which you need to remove. Unhook the legs then wiggle the hook around until it fully comes out. Next, turn the turkey with the legs pointing away from you and look for a little bag with the giblets (the heart, liver, etc.). Typically, this is stuffed inside of the neck cavity (which is now facing you), but sometimes it may be inside the main cavity. Either way, set it aside in the fridge if you want to use the giblets for gravy or just throw it away. When you’re done, you’ll be left with your turkey and 3 other pieces – the plastic hook that holds the legs together, the neck, and a bag of giblets. 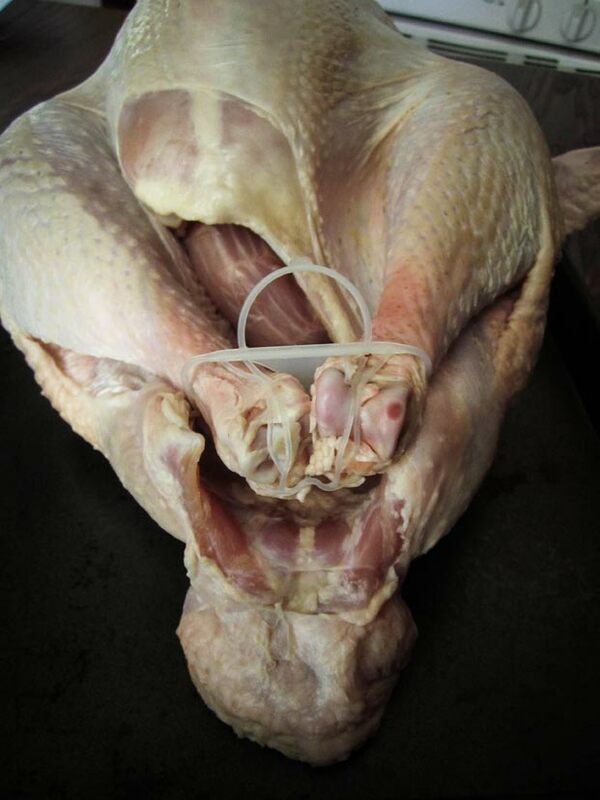 Your turkey may also have a little plastic plug (what they call a “thermometer”) stuck into the breast. If it does, pull it out and discard. The next thing you need to do is thoroughly was your turkey inside out in the sink with cold water. It’s important to dry it completely, both inside and out. One of the tricks we use to make sure we get the inside totally dry is to stuff the cavity with paper towels and let it sit for a few minutes to absorb every last drip of water. You’ll see a lot of guides out there that praise wet brining as the ultimate technique to getting a juicy and perfectly cooked bird. Don’t forget, there’s also the option to smoke or deep fry your bird (if you’re awesome like that) but for the right balance of final product quality (read: deliciousness) and realistic preparation, our technique for 2012 is DRY-BRINING. You can read all about dry-brining here but here are the basics. 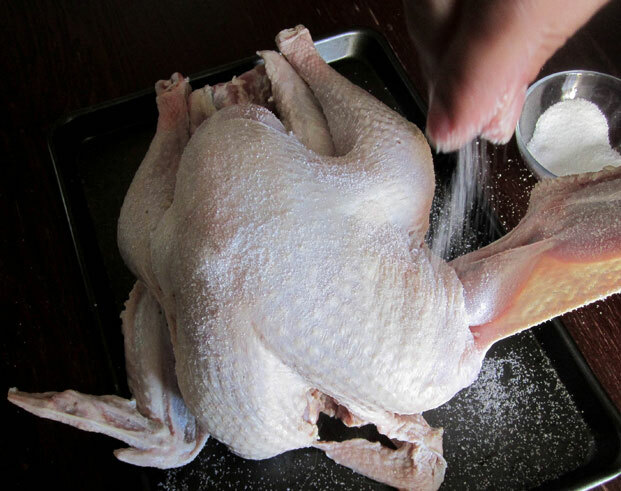 First, sprinkle your washed and dried turkey with a liberal amount of kosher salt. Don’t forget the inside as well. You want to make sure that you can see the granules of salt on the surface. Then, add a coating inside and out of whatever dry rub you like. We used a combo of dried fennel, sage, thyme, and black pepper, but use whatever you like. 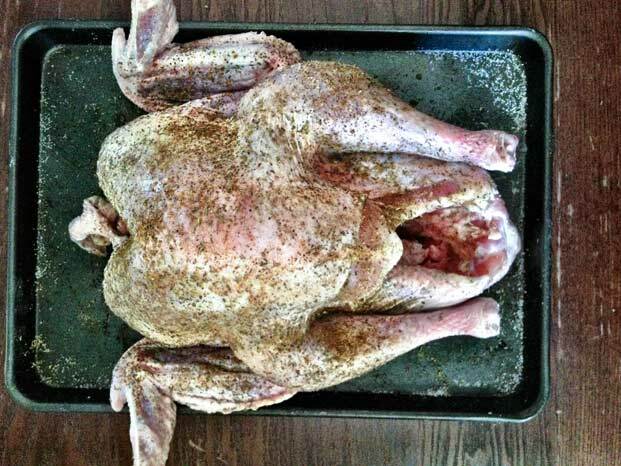 Rub the spices into the turkey all over. Put into a clean plastic bag (a brining bag works great for this) and store on a baking sheet or a plate on the bottom shelf of your fridge for 2-3 days. Turn the turkey over every day and drain off any liquid that may be released. The next step in the process is to make sure that the skin crisps up in the oven by ensuring that every last drop of moisture is out of the skin. 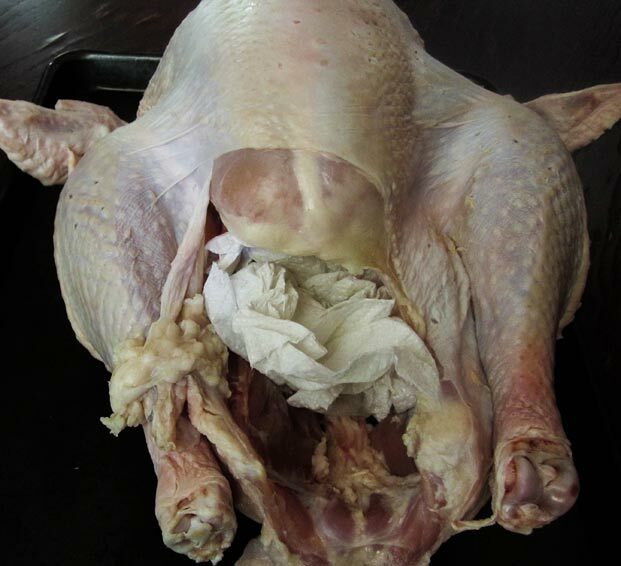 On the morning of Thanksgiving, remove the turkey from the bag and pat dry with paper towels. It may be damp but it shouldn’t be dripping wet. 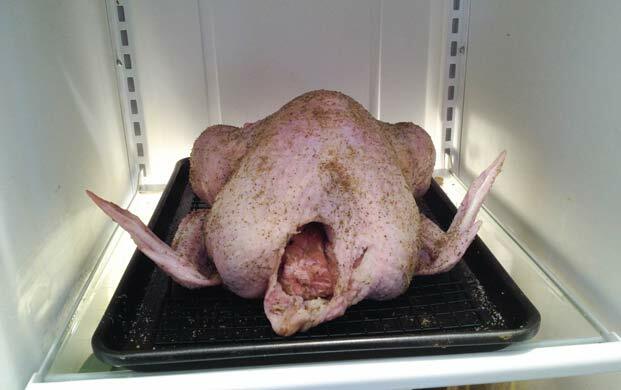 Place the turkey back on a baking sheet or plate and refrigerate, uncovered, for at least 4 hours or up to overnight. The cold dry air of the refrigerator will evaporate any moisture that is left. Remove the turkey from the fridge 1 hour before you’re ready to start roasting and allow it to come to room temperature. In order to make sure that the white meat and dark meat cook to the right temperature (and for a beautiful final presentation), trussing is the way to go. 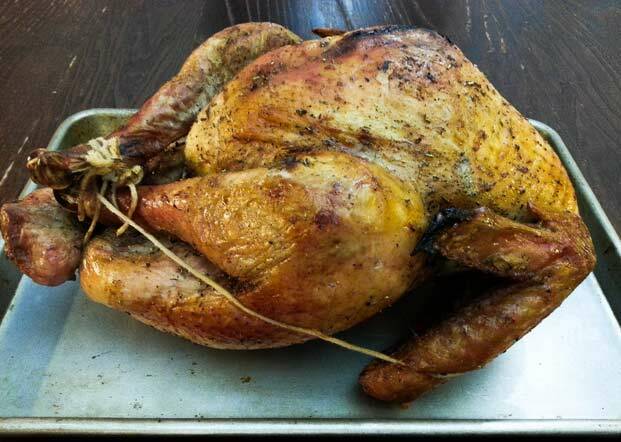 By tying up the turkey into a more compact package, the breast meat won’t overcook while the thigh is getting perfect. Here’s how to truss your turkey in under 3 minutes with butcher twine – you can do this as it’s coming to room temperature. No butcher twine? In a pinch, you can use unwaxed (and unflavored) dental floss. After you’ve trussed the turkey, squeeze a couple of big chunks of onions, celery, carrots, lemon, and parsley into the cavity to help flavor the turkey from the inside out. 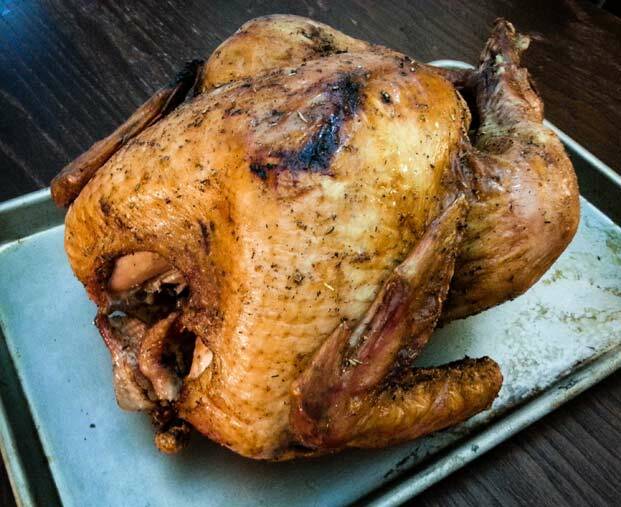 Finally, it’s time to put the bird in the oven – preheat the oven to 425 degrees F. If you have a V-shaped roasting rack, great, use that. 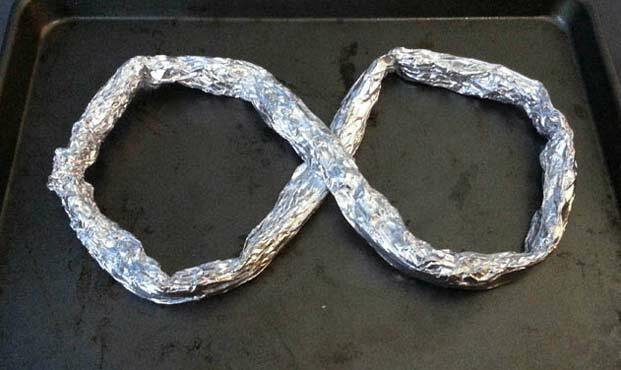 If not, no worries, you can make your own by simply scrunching up a long piece of aluminum foil into a figure 8. The goal is to raise the turkey off of the bottom of the pan so the hot air can circulate evenly around it while allowing the juices somewhere to drip without soaking the bird. One of our tricks to making sure that the skin crisps up all over is to start the turkey upside down with the breast facing down. We like to sprinkle some chunks on onion, celery, and carrots around the roasting pan to flavor the drippings. Roast the turkey at 425F for 30 minutes then remove. Turn the oven down to 325F. Using a couple of kitchen towels, carefully flip the turkey over so the breast is facing up and return to the oven. Cook until a thermometer inserted into the thickest part of the thigh registers 165F, about 15 minutes per pound. Since every oven is different, you want to start checking the temperature 30-45 minutes before your calculated time just to be sure. Double check the temperature of the breast – it should be around 155F. If you’ve ever watched a cooking show, you’ve probably heard this a million times, but cutting into a large cooked piece of meat right after it comes out of the oven is one of the worst things you can do! Allowing the turkey to rest, tented with foil, for 30 minutes will allow the juices to re-distribute and lock into the meat instead of spilling out everywhere. You could always slice the turkey right off of the whole thing at the turkey but we prefer to remove and slice all of the pieces before serving. After showing off your whole roasted turkey to your guests, take it back to the kitchen for carving. The slideshow below has step-by-step pictures but what we’re going to do is start by removing the legs, then the breasts, then the wings. Since the turkey might have cooled down a bit while you were letting it rest, this is the perfect time to heat it back up and give a final crisp to the skin. Take your cut pieces, arrange them on a baking sheet, and place into a 500 degree oven for 10-15 minutes until the skin starts to crackle. 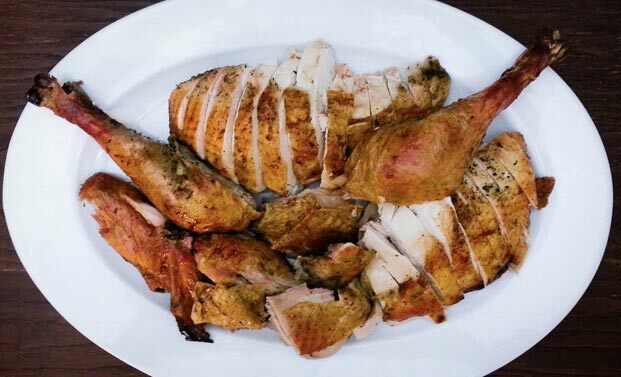 Remove, slice the breast into pieces, separate the thigh from the drumstick, and serve. 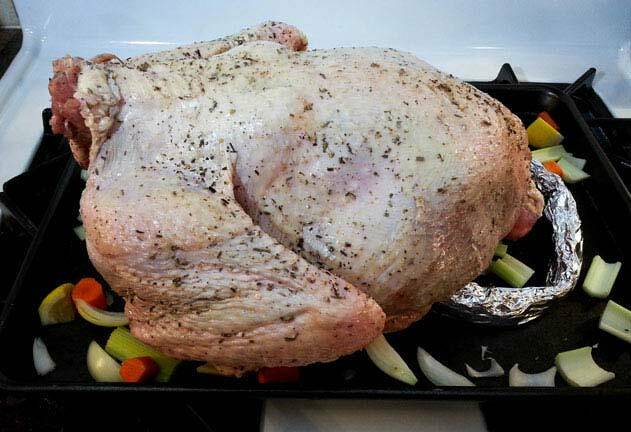 Place the rested turkey facing away from you on a baking sheet or large cutting board. Start by cutting the skin in between the thigh and the breast. Make small cuts and the leg should start to come off. Place your hand palm-side up under the thigh and bend it back until you hear the joint pop. Look for the joint and cut in between to remove the leg. Repeat on the other side. Turn the turkey so the legs face away from you. Make a long slice along on side of the breast bone to start to remove the breast. Overhead shot of slicing off the breast. Continue to slice along the breast bone, holding the skin in place until the breast is almost off. Turn your knife sideways and cut horizontally into the breast, above the wing. The entire breast should come off in one piece. Repeat on the other side. Similar to the legs, make a slice in the skin between the wing and where the breast was. Place your hand underneath and bend back to reveal the joint. As you bend the wing back, pop the joint and look for the space between the bones. Repeat on the other side. Cut in between the bones to remove the wing. Repeat on the other side. Place all of your pieces skin side up on a baking sheet and roast for 15 minutes at 500 degrees F to warm through and crisp up the skin. Turn the breast sideways and cut slices, holding onto the skin. We like our slices thick but you can cut them as wide as you want. Now we're going to separate the thigh from the leg. Point the leg away from you and cut straight down. 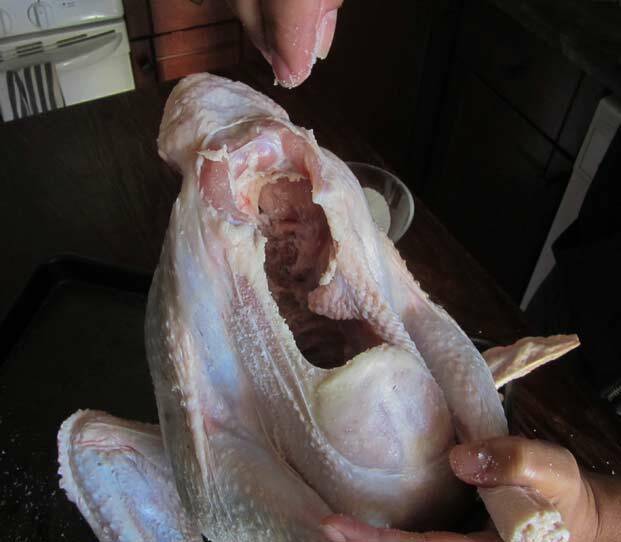 Pull the pieces apart to reveal the joint and cut in between the bones to separate the thigh and drumstick. Repeat for the other side. Questions? Email us at info@noshon.it and we’ll get back to you ASAP! Or, just leave a comment below. Happy Turkey Day! I’m dry brining this year! This is a great post! I love your guidelines plus the photos are fantastic and incredibly helpful. Thank you!!! One question though…Am I correct in understanding that the dry brine does NOT get washed, wiped or cleaned off before air drying and then roasting? Doesn’t all that salt make the bird too salty? @f14643cf2e5aeef07d3b0c8ca9572307:disqus That’s a wonderful question! 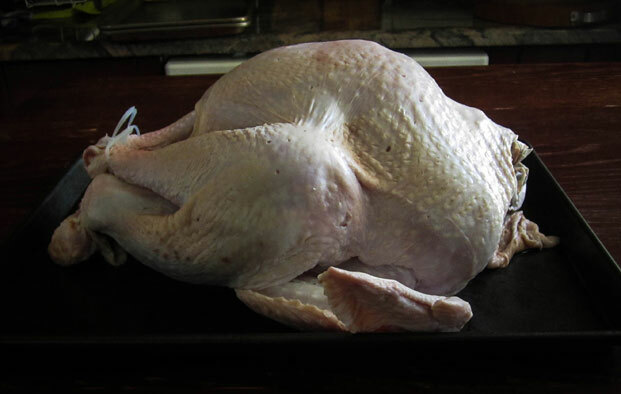 When you let the turkey sit in the fridge with salt for a few days, what happens is that you’ll start to see little droplets of moisture appear on the skin. When you remove it from the bag, it will feel damp, but not dripping wet. This is all of the excess moisture in the skin. If you notice in the step titled “Air Drying,” before you put it back in the fridge to air dry, you pat it dry with paper towels. Any excess salt will be wiped away at this time and no, it’s not too salty! What about adding stuffing to the cavity? How many minutes per pound for this method? Emilie – that’s a great question! We actually never recommend cooking the stuffing in the cavity for a few reasons. First, there often can be cross-contamination issues if the stuffing doesn’t heat evenly and your have raw turkey touching it. Also, stuffing greatly increases the density of the turkey to a point where you’re basically trying to roast a brick. It takes much longer to cook through fully, meaning there’s a much higher likelihood that your outside meat is going to be overcooked, tough, and dry. 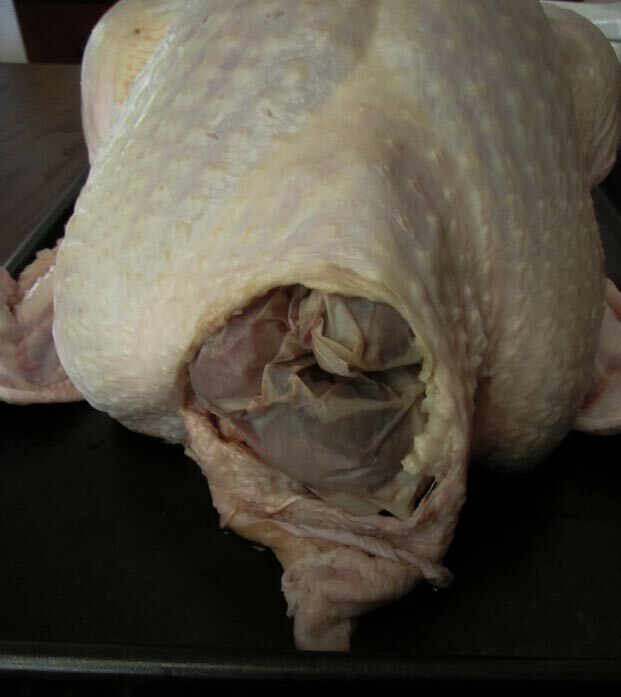 Third, it’s always a mess when trying to serve stuffing from inside the cavity while trying to carve the turkey neatly. For that reason, we recommend cooking the stuffing separately and just putting some aromatics inside the turkey like chunks of onions, carrots, celery, herbs, and lemon pieces. This will help flavor the inside of the turkey and the drippings as well.